This holiday season is by far the busiest one yet. With Christmas and family birthday parties at the end of the month it leaves absolutely no time for me to get ready for Katia’s first birthday. To say I’m overwhelmed is an understatement, too much to do and not enough time. That didn’t stop me from making time to enjoy this fun and simple craft with the kids. Brother helping paint his sissy’s foot is seriously the sweetest thing, we were both overly excited, simultaneously saying “WOO HOO” when we placed her little foot on the canvas and it didn’t smudge into a big blob. Stamping baby feet and hand prints are just as difficult as clipping their nails, sometimes it works out and others times you give up. Her cooperation that day made this adorable canvas into the best Christmas decor I own. If you look closely at this picture you will see my absolute favorite finishing touch, the eye lashes for the girl reindeer. Then we have big brothers high arched foot making his reindeer nose exceptionally long while sissy chunkier foot gave the deer a fuller faced look. 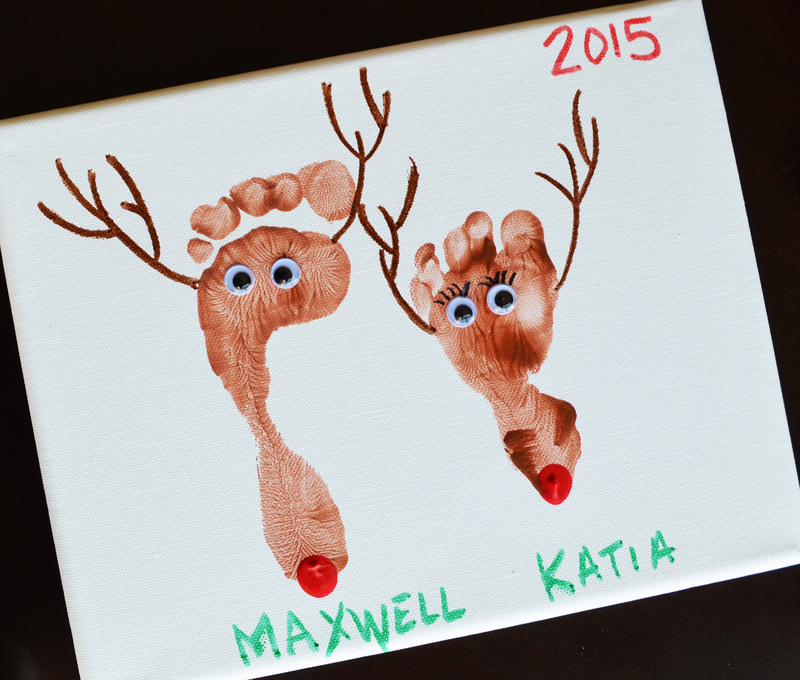 All you need is red paint and a little finger to stamp the nose, then take a brown marker and get creative with your antlers. I choose to do the antlers, but older kids may enjoy that part as well. To finish we added google eyes and those beautiful lashes on our girl deer, which is ironic since my boys are the ones with the thick full lashes in my house. I just love coming down stairs every morning to see this hanging on the wall. Once Christmas is over thanks to Command Picture Hanging Strips by 3M I can take my Canvas Art down with out leaving any marks on my wall.